WASHINGTON — Florida law school dean Alexander Acosta has moved a step closer to becoming President Donald Trump’s secretary of labor. 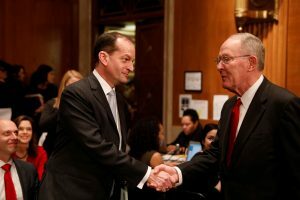 A Senate panel on Thursday voted along party lines, 12-11, to advance Acosta’s nomination to all 100 members of the chamber for a confirmation vote. There was no immediate word on when the Senate would hold that vote or whether Democrats will stand in the way. Acosta’s path to confirmation has been much smoother than the one traveled — and abandoned — by Trump’s first choice for the Cabinet post. Fast food CEO Andrew Puzder withdrew from consideration after majority Republicans balked at questions about his personal and professional life. Puzder had acknowledged employing a housekeeper not authorized to work in the United States.